I listen to a podcast called “You Are Not So Smart” hosted by David McRaney. The tagline is “A Celebration of Self Delusion”. The most recent episode is all about the concept of the self. All of us humans have some concept of our selves. We acknowledge an identity. I know I am Andy and I have a history and I have certain interests. I make choices on my own and choose to express my faith in a certain way. I choose my friends and fall in love and decide what to wear in the morning. But David presents a perspective that challenges all that and how we see ourselves. What he’s saying is that the self really doesn’t exist in the way philosophers like Plato or Aristotle saw the soul – as an “essence” of our being. To Hood, the mind is a consequence of our material self created to organise and make sense of all the things influencing us: our memories, our sensory input, our environment, our culture. Imagine a machine that copies a person exactly, down to the atom. That “second” person would be exactly the same as the first, right? Hood says, probably, even that person’s mind is copied. Hood discusses an experiment he did that shows even children have an understanding that mind and body are different. They believe that objects can be copied but not a mind—there’s something unique. Indeed, I bet most of us would say that the person and their copy would still be unique individuals. But for Hood, a materialist, the mind, one’s self-awareness, even one’s free will are simply (yet complexly) the result of physical responses. We like to think we’re in control, but is it a result of unconscious events that create an action? It’s true that our experiences, cultural environment, and relationships have a great effect on how we’ve been formed, indeed how our “self” has been formed, but the idea the podcast was examining is an idea similar to the story in the movie The Adjustment Bureau. The movie is about a team called The Adjustment Bureau whose job it is to ensure the plan for each person’s life happens the way it’s supposed to: Absolute predestination. (I won’t bring John Calvin into this.) 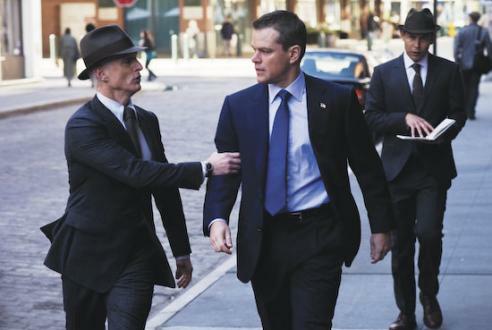 If the plan goes off course, The Adjustment Bureau steps in. They make you spill your coffee causing you to miss your bus to work and you don’t meet the person on the bus you’re not supposed to. Back on course. The movie even has a God figure called “the chairman”. It makes one wonder if we’re really in control. The movie is about external forces controlling you. Bruce Hood’s theory is about internal forces. In our independent western culture I think a lot of people would be resistant to the idea that there is something within them dictating their every move. Am I writing this blog post because my past experiences and memories added up with the brain activity that caused an idea to pop into my head after listening to the You Are Not So Smart podcast? Maybe if I ate something different for lunch or if the traffic light cycle differed on my commute home I would never had decided to write this. These are the strange ideas that make this question a real mystery. What’s the point of life—even in the context of faith—if we have no free will, no soul; if an external force (God) or an internal force (the brain’s construction of the self) is causing us to move and act like robots? The best bit of advice came from my girlfriend when I was saying that the Catholic church has answers for a lot of things (something I love about Catholicism) but there are some things it doesn’t address or offer clear answers for. She said that we have to maintain room for mystery. In science there’s plenty of mystery, but even in science we find God’s hand moving us. Do we know for sure? Of course not, but that’s why it’s faith. Could God work through those seemingly automatic biological mechanisms? Absolutely. Saint Ignatius would say that those internal movements like our feelings or the voice of our conscience are God guiding us though permitting our free choice. Again, we may never know in this life. I think the questions and ideas raised in the You Are Not So Smart podcast and in The Adjustment Bureau are fascinating, but just because hard questions come up doesn’t mean our faith has to waver. Gotta leave room for mystery! >> Listen to You Are Not So Smart and the full interview with Bruce Hood. I agree totally! I’m reading the holographic universe book and was skeptical to about the 20th page! The fact that our brands recieve interference patterns like hologram has been proven! Einstein even came to this conclusion but not right away! He brainstormed with the main proponent David Bohm not exculding Jung! We have no freewill It’s written and there are men that in the past were interpreted as angels! Possible men in black!